- Peel the potatoes, cut them into cubes, and boil them. Remove, discard water, and let the potatoes drain in a colander. - Dice the onion, and broil it in a bit of cooking oil. When it starts to turn yellow, add the ground beef and then spices (salt, pepper, chili pepper, and thyme), mix, and cook for about 4-10 minutes (until the beef is not red anymore). - Mash the potatoes, and add salt to taste. - Pick your favorite baking dish. Preferably, it should be non-stick. Ideally, if should also fit all the ingredients. Gently coat the baking dish with a bit of oil of butter to further help remove the moussaka later on. - Split the mashed potatoes in three equal quantities. Use the first third to form a uniform layer on the bottom of the baking dish. 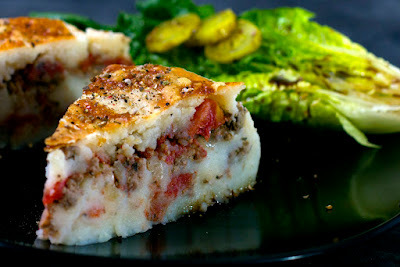 - Split the cooked ground beef composition in two halves, and use one to form a uniform layer on top of the potatoes in the backing dish. - Add half of the diced tomatoes in another uniform layer on top. - Add few more spices if necessary (remember that we did not add any salt nor spices to the potatoes or to the tomatoes). - Add another layer of mashed potatoes on top (though save the last third of them for the end). - Add another layer with the remaining ground beef. - Add another layer with the remaining diced tomatoes. - Add more spices, as needed. - Finally, add the last layer of potatoes. - For a nice color on top, top everything with thin slices of butter or shaved cheese. - Preheat the oven at 425F, and bake for 40 minutes. - Cut the serving slices vertically, and carefully remove each slice to preserve the layers. - Serve next to pickles, which also add some extra color to the presentation. - A cold beer goes perfectly wish this dish.